Barry, Jasper. 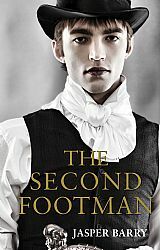 “The Second Footman”, Troubador Publishing 2013. Max might just be 19 years old but he has some big plans for himself. When the book begins, he is the second footman of the duchesse de Clairville but he has no intention of remaining in the lowly position for much longer. Set in France in the 1880s, we see that even a hundred years after the revolution that nobility has remained in its place and France is divided between the haves and the have-nots. Max’s plan is of finding a patron in the aristocracy who will work with him. He is sick over the class divisions in France especially since those in the upper class are only there because they were born into it. Max has a special talent—he is seductive and is able to use that on both men and women. His exceptional good looks have become a ticket to go places and he has a quick mind and confidence. No matter what he does, his mind is thinking about how to put his plan into play. “He is a man of the future” with few scruples and with no regard for morality and sentiment. He finds a patron but he soon realizes that he yearns for friendship and affection and these feelings are in conflict with his plan. Jasper Barry gives us quite a character in Max and we love him and hate him at the same time. There are times that he represents everything that we do not like to see in a person and there are times that we want to take him in and love him. He is a man living with two personalities in a world where there is only room for one. This entry was posted in GLBT fiction on February 9, 2013 by Amos.